Here, thin slices of potato are layered with slippery, soft onion and thin wedges of caramelised apple, then the whole covered with chicken stock. This is almost a meal in itself, but is also delicious with pork chops or sausages. Preheat the oven to 200°C, gas mark 6. Use a little of the butter to grease a 2-litre capacity gratin dish. Melt 50g of the butter in a frying pan, stir in the onions and cook gently, stirring often, for about 20 minutes or until soft and pale golden. Season with 1 tsp salt half way through cooking. Meanwhile, peel, quarter and core the apples. Cut each quarter in half lengthways. Melt 50g butter in a second frying pan, add the sugar and swirl the pan as the sugar melts into the butter. Add the apple wedges and cook gently, stirring occasionally, for 15 minutes or until the apples are pale golden and just cooked through. Peel the potatoes and cut into 3mm-thick slices. 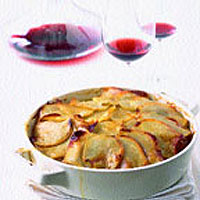 Cover the base of the dish with potatoes, season with salt and cover with half the onions and half the apples. Repeat and finish with a layer of potatoes. Bring the stock to the boil and pour over the potatoes - they should be almost covered. Dot with the remaining butter and bake for 1-1½ hours, or until most of the liquid has been absorbed, the potatoes are cooked, and the top layer is crusty and golden. Cover with foil if the top layer starts to brown too much before the potatoes are completely tender.